Run regression tests with automated builds to ensure your software stays bug-free after every application update. Thorough software testing after each update is vital to the success of any application, but time and cost constraints can make this challenging. As a result, teams often exclusively test only the most critical functions. This can cause unexpected bugs to sneak back into production, which not only leads to unhappy customers, but also increases maintenance costs. Regression testing is designed to prevent bugs from being introduced to an existing application feature and ensure that old bugs stay resolved. With regression test tools like TestComplete, you can automate regression test suites to reduce costs and cut testing times from days to minutes. TestComplete will enable you to run regression tests for any desktop, mobile, or web application. Increase team efficiency and find bugs quickly by running tests after every new build with our leading regression testing tool and runtime engine. As your project moves ahead and acquires new or rewritten code, your regression test suite will also expand. Eventually, it may contain thousands of small UI tests, which can only be run in sequence with the help of automated functional testing. TestComplete supports plugins for CI servers like Jenkins, which allows you to perform testing immediately after every change made without manual setup or execution. 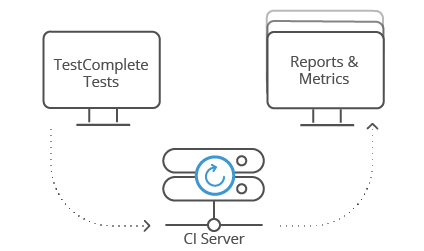 TestComplete enables you to combine scripted, keyword-driven, or data-driven tests with Selenium or API tests to run your end-to-end test cases as one regression suite. TestComplete also gives you the flexibility to execute your regression tests simultaneously or in a specific order based on grouped lists or parent-child relationships. Get detailed reports at different levels highlighting which of your automated regression tests failed, passed, or have warnings. You’ll be able to make informed decisions by tracking the status of test runs broken down by operating system, browser version, or resolution configuration. Minimize risk by automating regression tests based on their priority status. Create test items with categories like high, medium, and low priority to effectively communicate the order in which they need to be executed after every build. Change the run order for tests or move tests to a different category if needed.